According to assistant director of sustainability Jenna Musco, Hanlon asked the “Our Green Future” report to be written to help determine Dartmouth’s institutional priorities regarding sustainability. This led to The Sustainability Road Map, a comprehensive plan that touches on “the six operational categories: energy, waste, water, transportation, landscape and ecology and food,” said Musco. Musco added that though the plan outlines multiple objectives to meet within these six operational categories, and one of the focuses the College is currently taking is switching from the current No. 6 fuel to renewable energy sources. Though this plan is an improvement for the school’s carbon footprint, Catherine Rocchi ’19, a member of Divest Dartmouth and one of the seven student members on the task force that wrote “Our Green Future,” pointed out the College and its efforts for sustainability have room for improvement. Rocchi added that students have been pushing to have the trustees vote on divesting, but have reached a stagnant point due to a lack of cooperation from Hanlon. Rocchi said that she suspects Hanlon’s arguments are mere cover-ups for the real reason he is opposed to divestment: loss in donors. 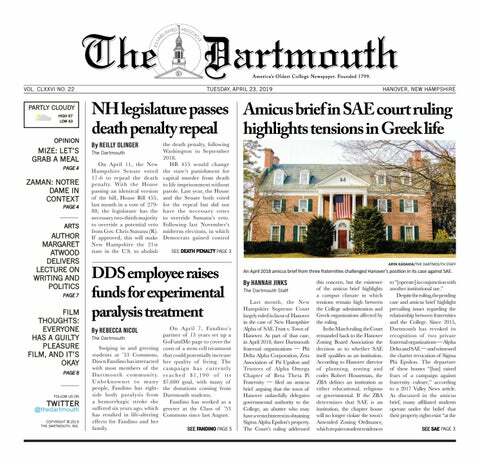 “I think President Hanlon is afraid that a few very wealthy, pretty conservative alumni might be upset if [the College] divests and then choose not to donate so much money to Dartmouth in the future,” Rocchi said. Similar to Rocchi’s criticisms of the College’s resistance to divestment, former sustainability office intern Hanover Vale ’20 also found that the College’s financial relations did not align with their plans to put sustainability as an institutional priority. Vale cited as examples the College receiving a sizable donation in 2017, reported as $80 million, from Irving Oil, a fossil fuel corporation, and to build the Arthur L. Irving Institute for Energy and Society. This decision is one of the reasons her feelings toward sustainability efforts at Dartmouth are “complicated,” Vale said. According to Vale, though she recognizes the “excellence” of the sustainability office and how “strong” the environmental studies program is, “fossil fuels are not the future” and so she feels “pretty bad” about the College’s decision to partner with Irving Oil. Vale added that though it may be economically strategic, the partnership is “a symbolic gesture, [and] it doesn’t broadcast to the broader academic community” that the College cares about sustainability, and “bitter ideas come to play” especially because student activism regarding divestment is overlooked by the administration. Despite their concerns, Vale and Rocchi both think the College is moving in the right direction. Both also commended other branches of the sustainability effort: the sustainability office and student organizations dedicated to sustainability respectively. Additionally, The Road Map to Sustainability may improve the College’s image in relation to sustainability. Musco said that the College’s increased focus on sustainability would keep the College accountable and show some dedication to sustainability. According to Musco, making adjustments to the College’s fuel sources from the No. 6 oil it currently uses to renewable energy sources to be “more sustainable and ... diversify our fuel supply so we aren’t tied to that single commodity [of No.6 oil]” is one of the plan’s priorities, but the plan does not specify which renewable sources to turn to because there may be discoveries of new and improved technologies or changes in the College’s needs. As a result, Musco said the plan should be considered “a working document” and the adjustments should be seen as flexible. According to Musco, some of the fuel options the College is considering are keeping No. 6 oil, switching to No. 2 oil and burning a liquid biofuel. According to associate vice president of facilities operations and management Frank Roberts, finding ways to make existing facilities more efficient in their energy consumption, particularly in heating, cooling and ventilating, is also an important part of the plan. Steele Hall is currently undergoing a project to create a heat pump chiller to conserve energy in the building’s cooling system, Roberts said. As for the fuel-switching process, the College has begun the process of increasing reliance on solar energy. According to Roberts, there are a total of eight buildings on campus that have or will begin construction on their roofs to install solar panels over this summer term, following five locations that finished construction in the previous academic year and preceding three more locations that will begin construction later this year. Roberts added that solar energy is also more cost-efficient for the College. Through a purchase power agreement, the College pays for the electricity and not for the panels on the roof, resulting in less expenditure on electricity than the current method of buying electricity from the grid, Roberts said. According to Roberts, the solar panels are also a pay-back project, meaning that any expenses now will be balanced out in the long run due to its cost-efficient properties. Cost is something the College will consistently consider when exploring other renewable energy options, Roberts said. Yet cost is not the only factor that is considered before decisions are made, Roberts said. For solar panel installation, Roberts claimed that the College also considers technical factors like the age, condition and size of the roof, the overall aesthetic of the building and whether there would be a hazard of snow falling off the panels in addition to long term effects on the campus. Friedland said he agrees that the institutional lag is a concern but said that generally, the College has done well with sustainability efforts. According to Friedland, students should focus now on individual involvement, a necessary component. He added suggestions such as reducing air travel, being mindful of dietary choices and remembering to turn off appliances. Vale said that Dartmouth faces large-scale challenges to sustainability as well, such as food waste, institution-wide lack of recycling or waste from “abandoned bicycles that have a lot of potential.” In order to overcome these barriers, both institutional efforts and individual efforts must be used to make the College a more sustainable space.